First things first, the reason why I’m writing this post is because I have had a few people ask me how I’ve got into marketing (which is my dream career), and I thought I would share some tips and tricks on how I have managed to get myself in this position, and hopefully they will be of use to you who are reading this. Stay put, get comfy and enjoyyyyyyyy. Now, I have a degree, yes. BUT….it’s not in marketing. In actual fact, I graduated with a BSc (Hons) Sports Studies with Media Cultures. REALLY random degree, and I think my Dad wasn’t so sure when I told him of this title. However, I was always told to study or do whatever I enjoyed doing, otherwise it’ll be difficult to progress and excel in your role. This is something that’s important, and VERY important to me for sure. I know this may sound really obvious, but I don’t think people really think about this when they’re considering their degree or career options. The reason I chose to study Media with Sport is because they were simply the two subject I was A) good at and B) really enjoyed. Now, there will be people thinking, well this can’t always be the case, and I agree you cant always do what you really want to or enjoy, especially if there are barriers. However, for me personally it’s really important to enjoy some aspect of what you study or do as job because you spend most of your adult life doing this on a day to day basis. Imagine how miserable your life would be if you absolutely hated what you were doing, but only you can change that! When I say attractive, I don’t mean pretty and covered in flowers and love hearts. No, with this I mean by having an up to date, tidy, descriptive yet precise CV, you will instantly become more attractive to potential recruiters/employers. I use to work in recruitment for a year or so, and I learnt so much around this topic!!!! Including what separates a good CV from a bad one. Taking a Side Step or Backwards Step Isn’t All That Bad! This point is really where and how I got into the position I’m in now! All because I sat back, reevaluated my options and made a drastic decision – buy hey, it all paid off right! So when I graduated, I didn’t know what I wanted to do, I was a young graduate who enjoyed social media, digital and web related things but I wanted all the money in the world. Yeah, well that aint happening all together I’m afraid just after graduating. I decided to go into recruitment in the City because It’s something I’ve been exposed to growing up, as my mum works in the sector (and has done very well for herself! Big up Mum, love ya!). Also, I knew there was good money to earn, and in my first year I did pretty well and managed to save a bit of money whilst living back at home, but then something hit me when I was stressed at work. I really wasn’t sure what I was doing, but I knew that what I was doing wasn’t what I’d always dreamed of doing or related to what I studied at Uni. I quite my job (but obviously not before I found something else!). I quit my first, full time, well paid graduate role in London, to do a 6 months unpaid internship as a ‘Communications Assistant’ for a very small children charity in N London. Crazy ay, well no not really because it was THE BEST THING IVE EVER DONE! The 6 months I did working for experience only allowed me to gain loads of knowledge and make me employable in that area. It allowed me to apply for marketing/comms jobs and allowed me to go to interviews and explain all the things I knew and had experience in, where before I wouldn’t have been able to do this at all! Also, one BIG bonus was that employers and recruiters can see how passionate and dedicated you are to be successful as making a decision like that isn’t a spare of the moment thing, it’s a hard one, especially if you have bills to pay. I had to get myself a part time job as well as working full time in the charity! But honestly, hands down best thing Ive done to date! This was something my Dad told me to do whilst I was just starting out Uni, and I thought hang on that’s a bit silly as I’m not even finished yet but do it, do it, do it as soon as you can. LinkedIn is such a great platform to be on, you can search for jobs, apply for jobs, find out jobs you never knew existed and also have conversations with people who know what they’re talking about. It’s pretty weird getting your head around it at first especially when you’re still new in your career and are not quite sure what you want to do, but once you get the hang of it, it’s a must! Everyone always said to me, it’s not what you know, it’s who you know. And, only up until recently where I’m in the working world do I actually fully get this. As annoying as it is, having good contacts and good relationships with people gets you further sometimes than having actual knowledge as it’s PEOPLE who hire you, not machines. Make yourself personable, and get talking to people, ask questions, sell yourself as a person not just as a job application like everyone else. Employers really want to know who’s behind the CV or job application, and that’s what will make you stand out from the rest. Obviously, still be you, but be the BEST you there is and this will be in your favour! 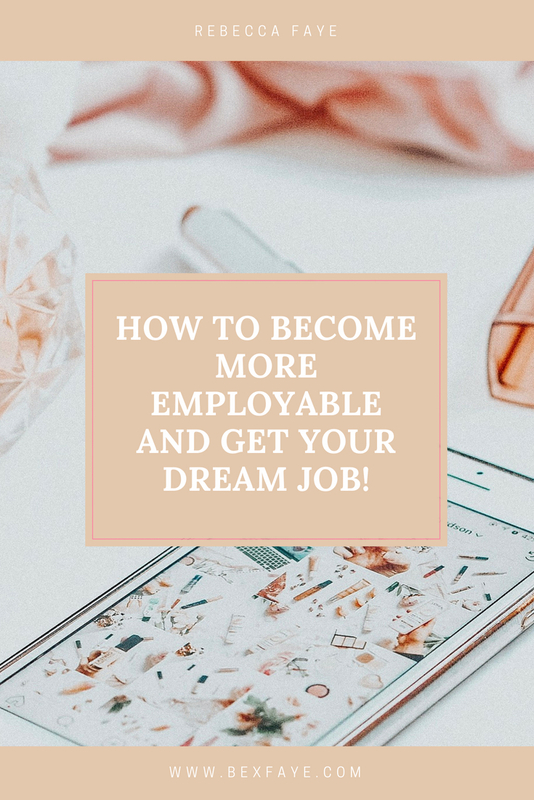 All these things really helped me become a more employable graduate and landed me my dream job working in marketing, including social media, web content, events and lots lots more! This is such a fab post – it’s so important to realise sometimes taking a step backwards can make such a great difference in the long run! This post is so helpful. I set up my Linkedin just before I started university as my sixth form teachers kept going on about it and honestly I am so glad I already have that platform and it is so easy to search for internships and jobs. Thanks love! It took a long time but if you keep at it, you’ll get there. I’m glad we’ve both found what we’re passionate about! This is so helpful, thanks for sharing your tips! This is so helpful! I’m currently in the process of looking for a new job and applying but no success just yet. Still fingers crossed. Thanks for this article, I’ll be using it for sure! Oooh, I love reading about other people’s journeys to their current job! And I totally agree that you shouldn’t be afraid to take sideways steps — as long as you’re learning and gathering experience, you never know where that position will take you or how it’ll come in handy down the road! This is so helpful! I’m going to uni in September so when I graduate (I know I’ve got a long time yet) this will be so handy, will definitely be saving this post to come back to then! Great post! I am sure it will help a lot of people. I’ve been really thinking about my career lately, I know exactly what I want to do I just need to build up the confidence to go for it! Lovely post.